There’s just something about New York City. Maybe it’s the earth’s electric core in the hub of Times Square? Which many a man or woman will get down on one knee for before the ball drops on December 31st. The greenery of Central Park in the middle of this concrete jungle that is the heart of NY like those tourist shop t-shirts. The FDNY. The NYPD. Or the freedom of towers like the Chrysler or the Empire State Building made by God’s of men, looking over all this from the heavens. To all that grey and green amongst the smoke and hot dog steam lined streets of yellow cabs. After all to be Frank like Sinatra, some guy did name this place twice. Or maybe it’s another Garden?! As the Worlds Most Famous Arena, M.S.G., AKA, Madison Square Garden really brings them out like when T.I. called himself the King of the South. But to be the King of New York like B.I.G. you really have to make it here. You see the LeBron James Nike billboards above Model Sports. “It’s only a crazy dream until you do it right?” So just do it! The Mecca of the Basketball Eden really draws people into the Big Apple like Adam and Eve. You’ll be tempted to take a bite. Even this writer has lost count at how many times he’s been here as BasketballBuzz was in attendance last night. The Garden or New York. And I’m not showing off I’m just proving a point to the amazing allure of the city that never sleeps, not even in a New York minute. And there’s anything but hell to pay from the kitchen to selling everything including the sink to be heaven sent here. Even Hollywood’s elite are escaping L.A to New York like Kurt Russell in reverse. In attendance last ‘Hellboy’ himself, David Harbour danced his way out of the upside down of ‘Stranger Things’ for a ticket. Whilst also making the courtside celeb rounds were ‘Greys Anatomy’s head doc Ellen Pompeo and Rakim’s D.J. brother and rap legend, paid in full, Eric B…no joke. Even the Freddie Mercury, ‘Bohemian Rhapsody’ of new, Queen movie king, ‘Mr. Robot’ himself, Rami Malek had a courtside seat for a game that always ends after 48, 82 and the playoffs with a final swan song of singing, “We Are The Champions’! Rami was in a rock star like rapture, playfully pulling in Knickerbocker die-hard Spike Lee (who also owns one of this year’s best movies in the incendiary ‘BlackKklansman’) for his shot on the jumbotron, all whilst taking selfies with Harlem Globetrotters introducing us to Kyrie’s Grandma Drew (let’s hear it for Hoops Green and Bull Bullard, dribbling and spinning, keeping us entertained at the break of play like dancers from ‘The Greatest Showman’). Malek must have felt magnificent as the legendary foot stomp and call and response clap back of Queen’s iconic ‘We Will Rock You’ beat on the PA like the rhythmic ball to hardwood pounds of the signature D-Fence call and Mexican Wave like reply. 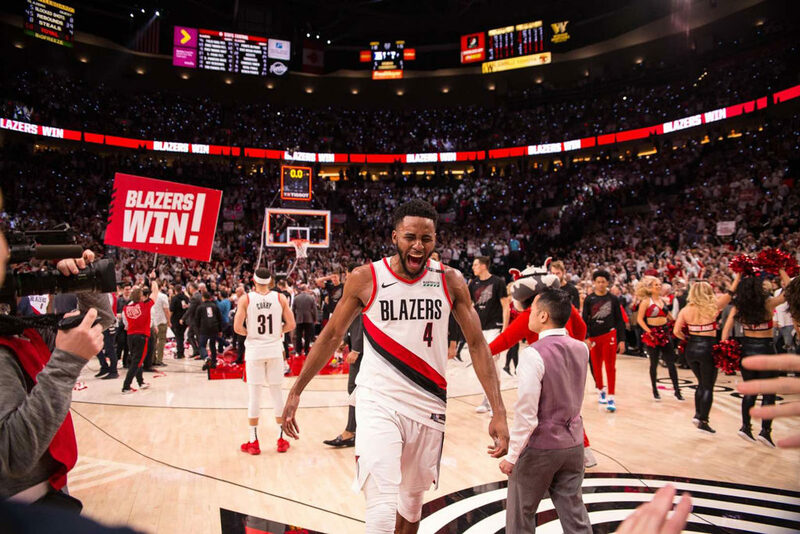 But by the last cry of Galileo, nothing really mattered as the Knicks bit the dust 118-114 to the visiting Portland without Porzingis to fight back against RIP City’s coroner Damian Lillard. It was Dame Times Square in New York last night as the number zero hero lit up the Knicks and tuned them up to the tune of 29 points, 8 assists and 6 rebounds. Along with best backcourt (now Bradley and John have hit a Wall in Washington on Beal street), perfect partner C.J. McCollum’s 31. 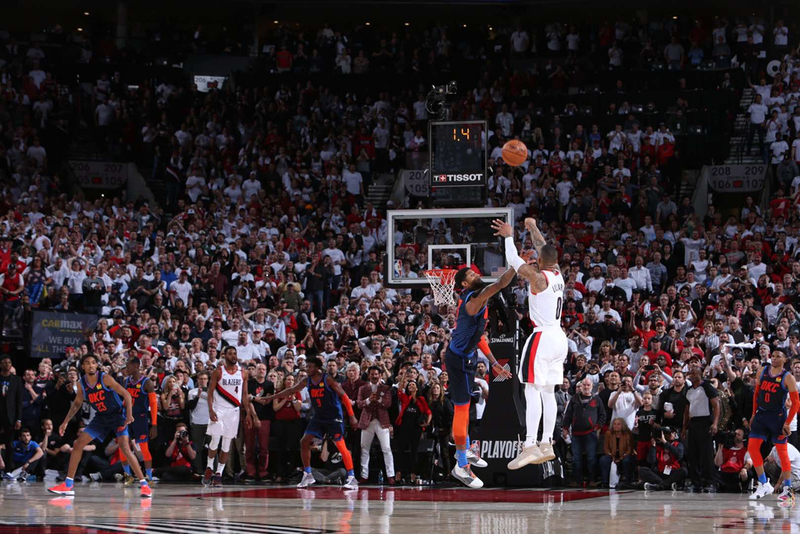 Which is just par for the course for a swing big elite star like Lillard. The hometown MSG faithful were as mad as magnesium however at a late game play for three saw Lillard (flopped) fouled, when many thought there were enough Academy Award nominated actors in the house already tonight. 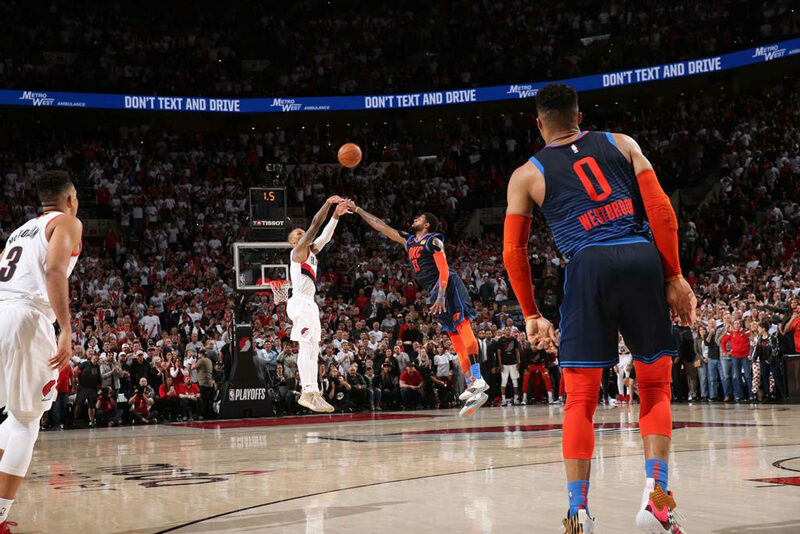 Using two of the same (I see what you did there Garden staff) local New York artist posters to beat distract Lillard at the line for three with boos, the Portland player LeBron-ed his first free (sorry King…just playing). Before being clutch from the charity as the remaining, standard two were all dollar for Dame. And that was pretty much the game. Although, if that was all she box score wrote it wouldn’t give much credit where due to these die-hard like Spike, young Knicks. Carmelo is gone and the Syracuse hometown hero probably won’t be coming back following his Rocket buyout. And Kristaps is injured and who knows when he’ll return. But the Knicks have plenty in reserve. Like star to be Emmanuel Mudiay, one of the best bigs Enes Kanter and youngsters that knock like Knox. Even Tim Hardaway’s junior with 32 last night can get it. As a matter of fact this roster playlist for the Spotify generation following the STAT and Marbury ‘Knicks Tape’ days look to fill the stat sheets until the scouting reports look for them. These young bloods play like the blood on the floor, hardwood warriors of the good old Knickerbocker days of Ewing, Starks, Oakley, L.J. and Mase (Rest Peacefully). Sure they’ll never touch legends like that, but the inspiration to come close is there to see, hiding in plain sight. Sometimes watching the Knicks is more frustrating than trying to get down those Garden escalators post-game after sitting in the nosebleeds. But sometimes…someday, somehow like the King Kong of New York, the elevator is going to take these young princes to the tip top of the Empire State with the rock. And wouldn’t that be a sight to see?